Hair thinning as we age is concerning, however, rest assured that it is quite normal. The majority of men will begin to notice thinning in their mid-thirties, although some will begin this process much younger. Women, begin to notice thinning in their 40’s and don’t tend to experience the same extent of loss as men. The process is “normal” but still causes great concern for those affected, especially for women. Age related hair loss is known as Androgenetic Alopecia and is only one of many types of hair loss. Hair loss can also be due to nutritional deficiency, illness, hormone imbalance, thyroid problems, autoimmune conditions, and stress. This is why blood work is often requested in cases of hair thinning. If there is an underlying cause that can be addressed, then it must be, or hair will continue to shed. 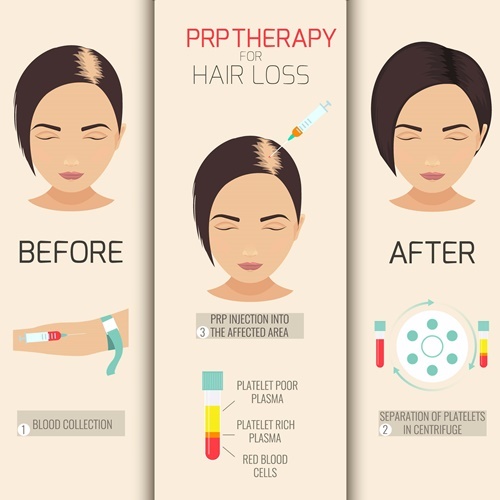 I’ve written in previous articles about PRP for hair thinning. It continues to be one of the more successful treatments for hair thinning. I do, however, believe that when it comes to hair, it is not a stand-alone treatment. Hair loss is difficult to treat, and often requires several different treatments to slow loss and increase hair volume. A good program to help maintain, slow loss and grow hair should include a topical treatment or two, a great shampoo, and the correct nutritional supplements. Following a good program combined with clinical treatments such as PRP and hormone support will increase the likelihood of successful treatment. There is currently a boom in the hair loss industry, with dozens of growth stimulating topicals on the market. Which one works? Truthfully, they may all have a benefit, but what works depends on the individual. There is currently no magic potion that “cures” hair loss, but with advances in science and technology, there are many products that can help. I encourage patients to try different formulas till something seems to help. Of course, you have to give it time; a minimum of three months to slow loss, longer to notice growth. Some of the more successful treatments on the market include: Minoxidil, Finasteride, Nizarol Shampoo and Spironolactone. I will often combine some of these pharmaceutical agents with more natural treatments. Herbal and natural compounds that have been helpful include Glutathione, Melatonin, Ashwagandha, Red clover, B-vitamins, Green Tea, and Vitamin D, to name a few. Glutathione and Green Tea may be beneficial due to their effect on tyrosine kinase activity. Currently, a class of drugs called JAK Inhibitors, which act on tyrosine kinase, have shown promising benefits for alopecia1 and are currently in the research and development phase. Red Clover has a component called Formonentin, which may help minitiarized follicles recover their size2. Ashwagandha is a favourite of mine for its stress modulating benefits. Topical melatonin alone or in combination with other topicals such as hormones and / or minoxidil has been helpful for women who experience hair thinning due to peri-menopause and menopause. For those struggling with hair loss, there is hope! Come in for an appointment and we can start navigating the journey. 1.Expert Opin Emerg Drugs. 2018 Mar;23(1):77-81. doi: 10.1080/14728214.2018.1444750. Epub 2018 Feb 26. 2.Planta Med. 2016 Jan;82(1-2):65-9. doi: 10.1055/s-0035-1557897. Epub 2016 Jan 12.Topical Treatment of Hair Loss with Formononetin by Modulating Apoptosis. Kim MH 1 ,Choi YY 1 ,Lee JE 1 ,Kim K 2 ,Yang WM 1 .